This is a table-top role-playing game set in the world of Neil Gaiman's novel (and television series) Neverwhere. These pages have all you need to learn the basics of West End Games' D6 system, create your own characters, and run adventures in the Underside. 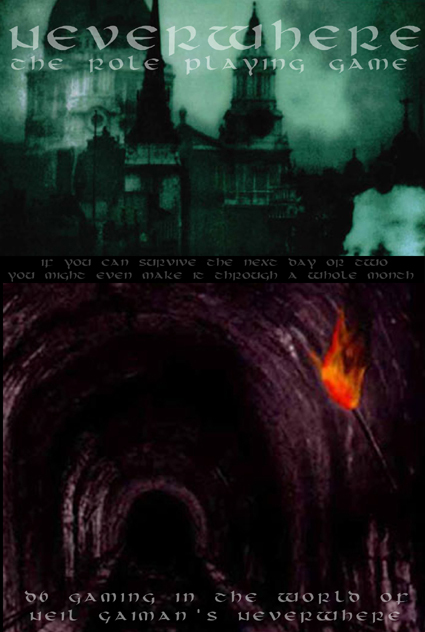 The world of Neverwhere exists parallel, aside, and under our own. In the subway systems, forgotten sewer tunnels, the shade of alleys, and the corner of your eye, a whole population of folk eke out a daily existence in a world full of magic, danger and endless, swirling surprises. These "underdwellers" pass invisible, right in front of our eyes, acknowledged for only a split second, but never recognized nor remembered. In their world, favors form the only real currency, alliances shift with the hours, and survival requires wits, brawn and more than a little luck. Say goodbye to your boring, mindless job, your bland little cubicle, and your safe predictable life. You've just fallen beneath the cracks of the everyday world and into the shadows of the Underside. The Underside: an introduction to the world of Neverwhere and its residents. Game Mechanics: the basic mechanics of the D6 Classic system. Characters: all you need to know to create your own characters. Attributes & Skills: descriptions of the traits and talents that make your character unique. Magic: Quirks, Charms, and Knacks. All that isn't mundane. Actions & Combat: grab a sword, aim a crossbow, dodge a blow and other ways to avoid shedding your own blood. Undercities of the World: places to go, people to avoid. The materials presented here are free for all to use, share and alter. But please, do not attempt to use them to turn a profit, promote another product, or hurt small animals. Let's just say that if you do, bad dreams are the least of your problems. The gaming system is copyright West End Games, who worked hard to create this fine system and are still producing great games. Go buy some and keep them in business. I highly recommend that you go out and pick up some West End Games products. They have a number of PDF-version games on sale now at RPGNow as well. This will fill in numerous gaps in the system and help you flesh out your D6 campaign. Also, Final Sword Publications produces the Psibertroopers role-playing game based on D6. You might find their rules for psionics useful for Neverwhere (or you might just like playing their game by itself!). The Matrix D6: fight to free the minds of humanity in the world of the movie The Matrix. Evil Dead D6: Horror. Action. Shlock. Load the shotgun, fire up the chainsaw, and get ready to blow away some undead scum.